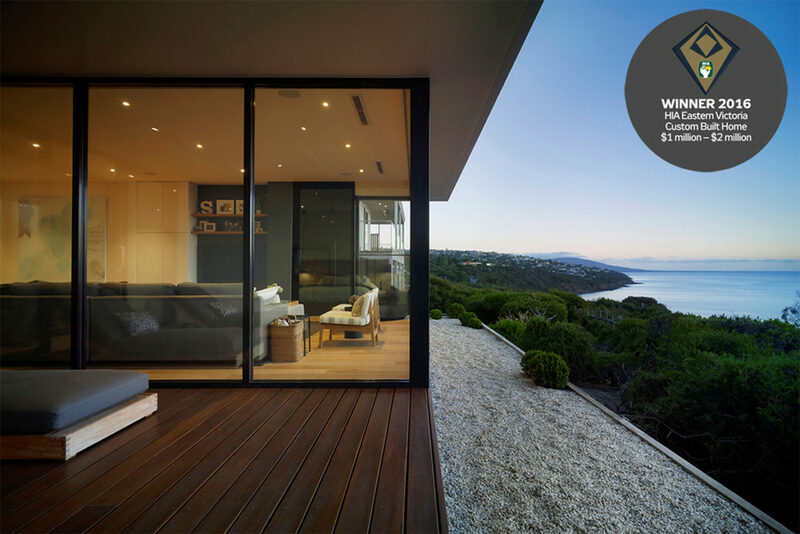 We are proud to announce the magnificent home at Mt Martha, designed and built by the Lowe team has won the 2016 HIA Eastern Victoria Custom Built Home in the $1 – $2M category. The 2016 HIA Eastern Victoria Regional Housing awards were held in September at the Mercure Portsea Resort, before a crowd of local industry leaders and peers from across the Eastern Victoria region. Clients Roger & Lisa had a vision to build a simple and functional home, practical for everyday living, with the lavishness of a holiday house. Maximising the views without compromising the comfort was paramount. The home is located, high above the woodland above the Esplanade with a breathtaking view. The brief was to create an outdoor area sheltered from the strong winds, and maintain focus on the sea views, within a built environment.